For the last one week we analyzed cricket nationalism (Mouka Mouka), as well as macho culture (Happy-Rubel) in India and Bangladesh. Now in another turn of events, death threats have been issued against Kabir Suman, songwriter, singer, musician, journalist, author, activist, and ex-parliamentarian (Lok Sabha, Parliament of India, 2009-2014), for supporting the Bangladesh team. The following are the chain of posts since March 19th, in reversed order. Translated by AlaloDulal.org Editors Tibra Ali and Nadine S. Murshid. Finally, after all these years this man has articulated what many have perhaps wanted to but haven’t been able to, as they wrote and spread rumors about me. Could he be one of those people who were behind the machete-wielding event at the Dhaka Boimela? I don’t think so. 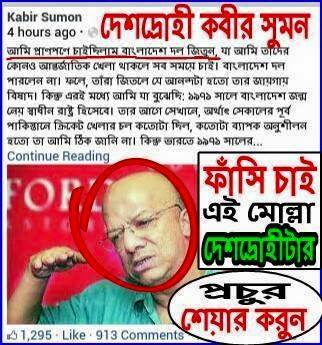 Mr. Aawara Romeo, it seems, is an Indian Bengali. My family members and I know that many in India and in West Bengal (more in West Bengal than anywhere else in India) who have read the above call for my death must have found their own feelings being resonated in those words. After everything that Indian Bengalis have written about me I can’t but think that. Ah! After such impassioned appeal (“Is there no one who can kill this piece of pube?”), after such frantic and helpless SOS, will no one come forward? I am a 66-year-old ageing man. My limbs tremble and shake. Everyone knows, especially famous journalists and anti-Mamata progressive-liberals, that I am spineless. My right knee hurts so much that I can’t move too well, I climb stairs only one-foot one-step at a time. Even children can take me down with utmost ease. Will it be a “Boimela” (book fair) for me too? The next Kolkata Boimela perhaps? Would it be right to keep me alive that long? Thank you, India’s kill-Suman Bengali mobs. You have shown the way. You have done so many things for so long. Why refrain from this? But, if you’re really your father’s son, show your face. Okay fine, come from behind. Nowhere did I say anything negative about India, Indians or the Indian Cricket Team. On the contrary I congratulated the Indian Cricket Team. At the same time I said that I seem to know the Bangladeshi Cricket Team better, and that I support them. That’s all! Immediately the way a lot of people from India started a torrent of curses and expletives aimed at me that I was amazed. But I didn’t say a single thing against either India or the Indian Team! Why don’t people just read what I wrote — It’s right here below. My impression is that everyone is thinking that I would be very hurt (the way a particular person and his followers had thought). Not a chance. I can imagine that a lot of Bengalis are angry at me. I have been living with this since “Tomake Chai” [his first music album from HMV] came out in 1992. I am used to it. And in reality, my time is almost up. It’s almost time for me to go into retirement. To learn and sing ragas, to do voice training for about five hours a day to keep the voice in shape, to read a few books, sleep, and teach music to a few. This is my life now. There was this time when England, in deep trouble, brought Colin Cowdrey from England. I was there when he entered the pitch. I was very young then. But I remember, Cowdrey entered the field like a king and the whole Indian team welcomed him. My hero — Polly Umrigar — showed so much respect to the tall and well-built man. And the whole audience stood up while clapping. It wasn’t until Cowdrey took the stance that people sat down. ‘Cricket – the king of all sports.’ There was even a book by that title. It was our holy book. No one in those days said, seeing how many people in Calcutta was celebrating Colin Cowdrey, that, look how these people are still licking the English boots, how they are still mentally colonized. No. That age is no more. And that cricket is no more. In those days, no one would have said, on the day of India-Pakistan match, that ‘today is the day of war between India and Pakistan.’ And the money involved in the game in those days was nothing compared to what is involved today. The era that I am from, in that era of proud subcontinent, on hand you had the India-Pakistan War, while on the other hand no Classical concert was possible in Calcutta without kheyal of the two great Pakistani artists, Acharya Salamat Ali Khan and Acharya Najakat Ali Khan. When their 45 rmp disk of pahari thumri was released in 1962, which went on to capture the whole of India within a few months, no one was able to even imagine — that these two artists are from Pakistan, therefore to like them is to betray one’s own country, and to betray India. I write not to explain anything, I write only to write. Time is short. Maybe someone will benefit from these reminiscence. Those whose religion it is to oppose me, these words won’t percolate through their thick brains. But maybe normal people will enjoy reading this. Who knows? Yes, I want to repeat, I wanted Bangladesh to win. I have congratulated the Indian Team, and I will again. But I would have been happy if Bangladesh had won. I was ardently wishing the Bangladesh team to win, which is what I always want whenever they play international matches. But, the Bangladesh team did not make it. So, instead of the happiness that I would have felt if they had won, in its place I felt lugubrious. But, this is what I have understood: In 1971 Bangladesh was born as an independent nation. I don’t really know how extensively cricket was played and practiced before 1971, i.e. when Bangladesh was East Pakistan. But Indians have been playing and practicing cricket from far before 1971 on a much grander and extensive scale. India is a huge state. Cricket is played in many corners of the country from where talented players are selected for the national team. Bangladesh, in comparison, is much smaller. There is a direct relationship between cricket and economic resources. In India the patrons of cricket were the princely states – the nawabs, and the kings (from the days of the British Raj). They even played the game themselves – such as Maharajkumar of Vijaynagaram. Another was Gaekwad, and some others too. Bangladesh is not economically rich. During the days of undivided-India I don’t recall any zamindars of east and west Bengal playing cricket, neither have I heard of any zamindars who have acquired fame as a cricketer; at least I am not aware of any. In fact, the Bengalis who made a name for themselves as cricketers in undivided-India were more or less from the middle-class. In independent Bangladesh the tradition and practice of cricket, of international standard, is relatively new. That this small, far more underdeveloped in fabrication-industry, primarily an agro-based country, has made such great advancements in this game, in such a short period of time, is indeed remarkable. In the history of cricket this is not very common. One of the only other countries that I can think of is Sri Lanka. I’m, of course, not an expert; I only keep track of bits and pieces of cricketing news. But the kind of cricket that Bangladeshi players are playing gives me hope that in a few years time they will see better results; one doesn’t need to be a Bengali for that. If any normal, thinking astute Indian considers it this way: that an Indian state, like West Bengal or Orissa, is playing the Indian national team, it’ll perhaps be easier for them to fathom. The Indian team has played well and won. Bravo! Likewise, Indian players and cricket lovers might find it difficult to imagine, considering Bangladesh’s struggles since its independence (at least in terms of cricket), the game that Bangladesh played against not just Indian players, but against some of the world’s best, facing the gargantuan challenges, and standing their ground and delivering; even if I hadn’t been a Bengali I would have hugged them and kissed their cheeks, while clapping for the Indian team in the same breath. If this were a fairy tale, the princess would have given her heart to Bangladesh today. If it were so that the winner of the game would have to be her lawfully wedded partner for life she probably would have acquiesced, but in her heart she would have waited for the Bangladesh-prince to come take her away riding on his horse and to an unknown destination. Today is ending with a ball. A gray twilight is descending upon Bengal. Near the end of my life this graying twilight envelops me in a wistful melancholy. But even then I find happiness thinking – a galloping fierce black horse. The reins in the hands of the Bangladesh-prince [AoD Editorial: alluding to the cricket team] is riding on. Holding him by his waist, her face resting on his back, the liberated princess dreams on. আহা, অমন আকুতি (“বালটাকে মারার কেউ নেই? ), অমন হাহাকার, অমন অসহায় SOS পড়ে কেউ কি বুক বেঁধে এগিয়ে আসবনে না? আমি তো ৬৬ বছরের এক জরাগ্রস্ত লোক। হাতপা কাঁপে। সকলেই জানেন, বিশেষ করে নামী সাংবাদিক ও মমতাবিরোধী প্রগতিশীলরা যে শিরদাঁড়া নেই। ডান হাঁটুতে আর উরুতে এতো ব্যথা যে বেশি হাঁটতে পারি না, সিঁড়ি দিয়ে উঠি এক পা এক পা করে। বাচ্চা ছেলেরাও আমায় সহজেই ঘায়েল করতে পারবেন। তা, আমার বেলাতেও কি ‘বইমেলা’? পরের কলকাতা বইমেলা? অতোদিন বাঁচিয়ে রাখাটা কি ঠিক হবে? একবার, ইংল্যাণ্ড দল মহা ফাঁপরে পড়ে কোলিন কাউড্রেকে নিয়ে আসেন ইংল্যাণ্ড থেকে। যেদিন উনি ইডেনের মাঠে নামলেন, আমি মাঠে ছিলাম। কত অল্প বয়স তখন আমার। মনে আছে, কাউড্রে মাঠে নামছেন রাজার মতো, ভারতের গোটা টীম তাঁকে সমানে অভিবাদন জানাচ্ছেন। আমার হিরো – পলি উমরিগর – লম্বা, সুদেহী মানুষটি কী-সম্মানই না জানাচ্ছেন। আর, সারা মাঠের দর্শক দাঁড়িয়ে উঠে করতালি দিচ্ছেন। কাউড্রে স্টান্স নেওয়া পর্যন্ত কেউ বসেননি। ‘খেলার রাজা ক্রিকেট’। একটা বইই তো ছিল। আমাদের ধর্মগ্রন্থ সেযুগে। কোলিন কাউড্রেকে নিয়ে কলকাতার বিপুল সংখ্যক দর্শকের মাতামাতি দেখে কেউ কিন্ত বলেনি – এ মা, এরা এখনও ব্রিটিশের পা-চাটা, এখনও মন থেকে গোলামি যায়নি!